As the wedding party steps out into Lijiang's old town square, curious tourists flock to the group, dazzled by their traditional Naxi attire. Many question whether the pomp and ceremony is a performance. In fact, the Saturday afternoon spectacle is the real wedding of groom He Libao, 29, and bride Duan Jing, 21, both members of the Naxi, one of China's 56 official ethnic groups. The Naxi population numbers around 300,000. Most live in Lijiang, while the rest reside throughout Yunnan province and in neighboring Sichuan province and Tibet Autonomous Region. 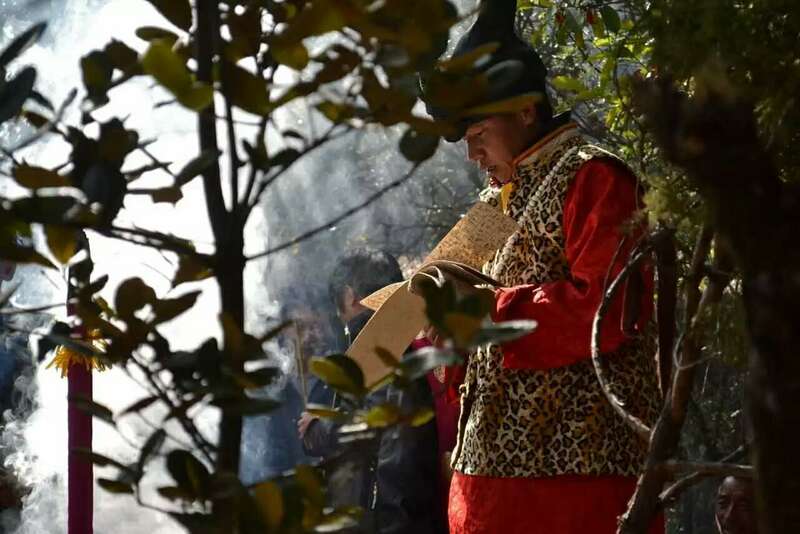 Though traditional wedding ceremonies are still common in remote villages, the custom has faded in the city of Lijiang since the Qing Dynasty (1644-1912), when cultural influences from the Han ethnic majority began to overwhelm the area. But now, a local wedding planning company called Xihe is reviving interest in the tradition — partly at the behest of tourists. "Tradition is like a siege," Wang Dejiong, a Naxi folk culture researcher, tells us. "People outside want to get in, while people inside want to get out." Most Naxi people follow the Dongba faith, which teaches that humans and nature are brothers. Before the founding of the People's Republic of China in 1949, at important events such as weddings, the Naxi would invite a dongba — or shaman — to perform chants. Highly respected as accomplished scholars of Naxi culture, dongba pass down their duties within families from generation to generation. Xihe organizes around two weddings every week, including the recent Saturday ceremony, which kicks off at Yulong Bridge, where young couples would court in the old days. Groups of Naxi boys and girls sing in praise of the bride and groom. The newlyweds then release fish into the river to show their respect for nature. After the fish are released, the bride is carried through the center of the old town in a fringed bridal chair — followed by a wedding party of close to 50 people — to a traditional Naxi house with three wings enclosing a courtyard. In the courtyard, a dongba presides over the "soul-binding" ceremony — the most important part of the wedding. The dongba ties the couple's hands together and announces that they can never again be separated. Afterward, dozens of young and old dance hand in hand, wishing the newlyweds happiness and prosperity. The ceremony does not include vows, as Naxi people are shy about expressing love verbally. "We believe actions speak louder than words," the groom explains. "Our souls are bound together," the bride says after the ceremony. "If I ever got a divorce, I'd feel like I lost my soul." The ceremony venue is also the headquarters of wedding company Xihe, founded by Naxi woman He Yumiao — who is not related to He Libao. The company's name means "joyful crane" in the Naxi language, and people worship cranes and consider the sacred birds to be a symbol of a blessed marriage, as cranes are faithful to their mates. Once one dies, it is said that the other will starve itself and die for love. Since its establishment in 2008, Xihe has arranged traditional Naxi wedding ceremonies for more than 1,000 couples in Lijiang. Wedding packages start at 6,999 yuan (US$1,050), and the ceremony lasts about one and a half hours. He Yumiao, now 38, was born and raised in a Naxi household with three generations living under one roof. "I was so used to my own culture — all I wanted was to escape from it," she tells us. After graduating from high school, He Yumiao moved from Lijiang to Kunming, Yunnan's provincial capital, in 1997 and worked at the city's Naxi minority village tourist site as a performer. It was there that she wore traditional Naxi attire for the first time. Every day, she answered questions from tourists hailing from all over the world who were interested in the Naxi way of life. "It was overwhelming to see that they cared about my culture, which I took for granted every day," she says. A couple of years later, He Yumiao moved back home to Lijiang and became a tour guide in the old town. In 2006, she met a Singaporean couple who had come to the city on their honeymoon. They were enamored with the local culture and asked whether she could arrange a traditional Naxi wedding for them. At the time, she knew didn't know much about the ceremony — nor were there many examples in the city that she could follow — but she was determined to try. With the help of elderly locals, she organized a Naxi wedding in just a few days at Lijiang's Black Dragon Pool Park. It was then that He Yumiao decided to devote herself to preserving the Naxi wedding tradition. "I finally found where my heart belongs," she says. "Folk customs are critical to an ethnic group, and a wedding celebration is of the utmost importance because it reflects the values of the [Naxi] culture." Naxi couple Li Jixing, 35, and He Dong, 38, stumbled upon the Singaporean couple's wedding ceremony while they were strolling in the park, discussing their own wedding plans. Though they had heard elders speak of traditional ceremonies, it was the first time they had witnessed one for themselves. "I had never seen such a happy and glorious wedding in all my life," Li says. The couple watched the entire ceremony and asked He Yumiao to arrange a similar one for them. "We always wanted a traditional wedding, but we couldn't find a wedding company that offered such a service," He Dong, Li's husband, says. The couple held their wedding ceremony in 2007 in their courtyard at home. Because He Yumiao's business hadn't officially launched yet, the ceremony was simple and brief. "But at least we had a ceremony," He Dong says. Otherwise, they would simply have had a banquet with family and friends like most couples of their generation. After He Yumiao launched Xihe, she didn't book her first wedding until six months later, when a transnational couple from Scotland and central China's Hubei province asked her to arrange a wedding ceremony in Lijiang that brought together Naxi and Western customs. Photos of the ceremony posted online brought her many new customers. But for the first five years of running her business, He Yumiao was frustrated that most of her clients were tourists, while many Naxi people paid little attention to their own traditions. "Locals would rather pay thousands of yuan to have a Western wedding at a church," she says. She credits tourists for helping to turn the tide. "The tourists have made Naxi weddings trendy and fashionable, which piqued locals' interests," she says. Now, half of her clients are locals, as more and more Naxi young people have begun to take pride in their traditions. Yet the romance of the Dongba ceremony continues to draw many outsiders. Yang Cailing and her husband are both Han but have lived in Lijiang for the last decade. Though they had a Western wedding in 2012, Yang always felt something was missing. She decided she wanted a second wedding after finding out that the Naxi language had no word for divorce. "At first, [my husband] was against the idea because he thought it would be like a performance for tourists in the old town of Lijiang," Yang laughs. Meanwhile, she hoped the ceremony would spice up married life, which had begun to feel dull after a few years. The 31-year-old persuaded her husband to have a Dongba ceremony in January, and one month later, she found out she was pregnant with their second child. He Yumiao started her company mainly out of curiosity, but she has since developed a deep sense of cultural responsibility. "We are probably the last generation of Naxi people to be raised in our local culture," she says. "If I didn't do something to save our wedding ceremony traditions, who would?" But cultural researcher Wang still has doubts about the tradition's prospects. "Naxi minorities are sinicized and tend to worship anything foreign," he says. "It's hard to revive the tradition, but at least [He Yumiao] is doing something." This article by Fan Yiying originally appeared on website Sixth Tone. It is republished here with permission.